The best porcelain of the Kangxi period has pure white body, smooth clear glazes and skilfully applied, sophisticated decoration. Apart from blue and white, the main porcelain product of the period was 'famille verte', a term coined in the middle of the nineteenth century by the French ceramic collector, Albert Jacquemart to refer to the large group of ceramics in which the prevailing colour within the over-glaze enamel repertoire was green. The auspicious imagery on this fine example of 'famille verte' porcelain is from Daoist philosophy. Xi Wangmu, Queen Mother of the Western paradise, where the peaches of longevity grow, is depicted accompanied by an attendant. A spotted deer (symbol of longevity) draws a cart carrying an elixir. 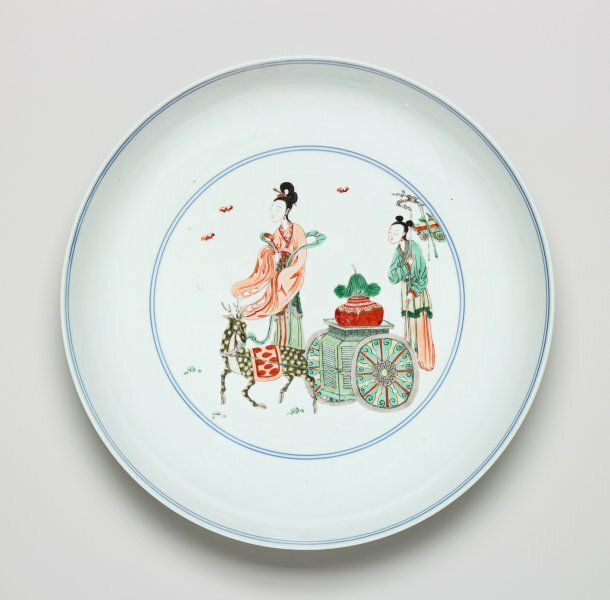 Bats, symbols of happiness, reinforce the good wishes, while the reverse of the dish is decorated with 100 archaic Daoist variations of the character 'shou' (longevity). 'Asian Art', AGNSW Collections, 1994. pg. 203.